I promised to bring this out. This simple Application copies out all needed files from your Rayman M CD and put it there were you want. No more emulating a 32bit Operating System and copy the installed files! You can even set your language you want. English,French,German,Spanish,Italian,Swedish,Finnish,Norwegian and Danish are programmed. It works with the 2 CD release and the 1 DVD. Unfortunately Rayman Arena is not supported I'm sorry! Just insert your CD select a Language and a directory to install and that's it!! RaymanM Remake.iso ◄ Highly recommanded! Last edited by Snagglebee on Sat Apr 11, 2015 12:10 pm, edited 2 times in total. Actually Rayman M worked with 64bit Systems before. The only problem here was that the original Installer wasn't compatible (same problem as Rayman 2). That's why I named this Installer and not Patcher. This message is extreme strange! There is no such line in my source. Try to download it again! Move the Installer to your desktop or somewhere else in your C: drive. It's important that you keep the installer and Install Directory in C: and not somewhere else! But I'll reinstall it using the recommended directory. Maybe that will work. I also noticed some error message in the console window (something like "Files" is not defined or so) after it had copied everything, but the messagebox then said "installation complete" so I assumed it was done. EDIT: Maybe the "Files is not defined" is because your installer could not figure out what to do with the space in "Program Files"? Last edited by Robotic Teensie on Fri Apr 05, 2013 3:18 pm, edited 2 times in total. I updated the file. Hopefully it will now work. So I ran the DX8 setup, and it said "installation succesful" immediately. It was so fast that I suspect it just checked my PC, saw I already have DirectX installed, and stopped. After running the DX8 setup, RaymanM.exe still says "DX8 not initialized - please run setup". Step 2 wrote: So I turned on the Windows XP compatibility mode... then it gives me the "CD not found" error you saw above. Step 3 wrote: Now I tried to run the RaymanM.exe on CD 1 (not in the install directory your installer made) and without compatibility mode it keeps complaining about DirectX 8 again. Step 5 wrote: So while this messagebox is still on my screen I swap disks, and when CD2 is in I click on "Retry". Step 6A wrote: The first time after step 5 the intro video played. I thought "YES, it's working!"... but after the intro was done, a messagebox came again saying "Please insert the CD". No matter what CD I tried, it just wouldn't accept the CD. When I tried to switch to the RaymanM process it stopped working. Step 6B wrote: I tried steps 4 and 5 again... run the exe on CD1, swap disks, click Retry... but now I get this. Clicking "Try Again" or "Continue" leads to the same message popping up... after I clicked "Cancel" a few times Rayman M stopped working. It just seems like some files are not installed correctly and or are corrupt. Are you sure that the CDs aren't broken? Install Windows OS 32bit system in a PC Virtualizator like Microsoft Virtual PC. I bet Rayman M won't start there too. Do you want to decomplier my program? No problem just put the parameter "-decomp"
1. I made a new directory on my C: drive. 2. I copied the whole contents of CD1 to that directory. 3. 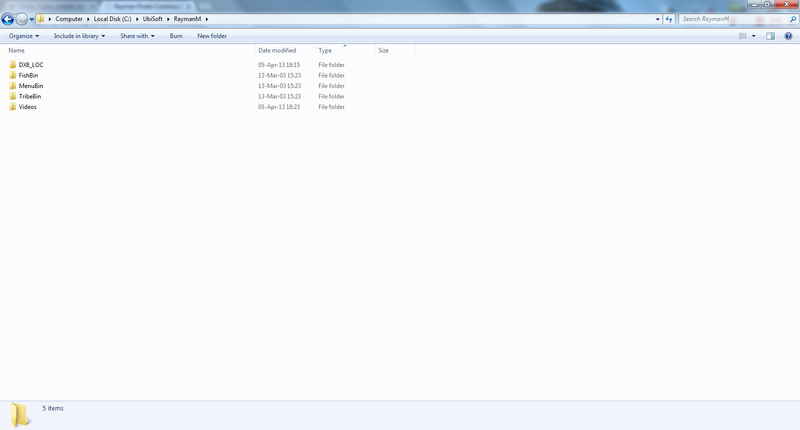 I copied the whole contents of CD2 to that directory (minus autorun.inf and RaymanM.ico, which were conflicts). Running RaymanM.exe as administrator with CD2 inserted will cause the game to run fine! So I'm afraid your installer isn't working maybe you forgot some file? Copying the complete contents of CD1, with the audio tracks and videos of CD2 added, will result in a working game! Sorry for bothering you but I remade the installer. Would you try that out? Thank you! Sure, I'm happy to help! Okay. First of all 'necessary' is not spelled correctly (I think you fixed it for the R2 patcher but not for this one). There's no .exe... so I can't start the game... there also seem to be .dll files missing. Running RaymanM.exe as administrator then results in a working game! OK.. I updated the file. It should now work! It's a shame from Microsoft that they took the 16Bit compatiblity from Windows Vista 64bit and Windows 7 64bit but brought it back in Windows 8!! still does not work... the install directory still ends up looking like the screenshot above (without these 5 files). Did you tryed to run as Administrator? The game wouldn't work for me in windows 8 so I tried it in 7 64 bit and it worked fantastic! Rayfist wrote: The game wouldn't work for me in windows 8 so I tried it in 7 64 bit and it worked fantastic! LoL? It doesn't work for me in Win7 but in Win8. ...nope, I ran it as an administrator... those 5 files are still not copied. Robotic Teensie wrote: ...nope, I ran it as an administrator... those 5 files are still not copied. I have run it twice (both times as an administrator) and I got the same result on both occasions. The 5 files that refused to be copied previously (the .exe files, the .dll files, that .ini) are now copied fine. The program now copies files over a LOT slower than before. Large files such as the texture archives (.cnt) especially seem to take a long while. It seems to get stuck at copying E:\TribeBin\tex32.cnt. That is the last entry I saw in the console window. After waiting for 10+ minutes it still had not moved on. The console window is impossible to close. Even after killing processes with Windows task manager the console window would not go away. I was forced to reboot my laptop. No program should be allowed to behave like this. I'm really not sure why it's copying files so slowly and why it's getting stuck... tex32.cnt seemed to have the same filesize in the install directory as on the CD (114 MB), so maybe it was the next file in TribeBin (vignette.cnt) that was causing problems?